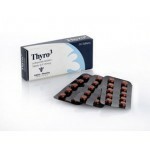 Liothyronine is a form of thyroid hormone used in medicine to treat hypothyroidism and myxedema coma. It is often sold under the brand name Cytomel. Liothyronine acts on the body to increase the basal metabolic rate, effect protein synthesis and increase the body’s sensitivity to catecholamines. The thyroid hormones are essential to proper development and differentiation of all cells of the human body. These hormones also regulate protein, fat, and carbohydrate metabolism, affecting how human cells use energetic compounds. Bodybuilders use this compound to burn off fat and give them a better look. Liothyronine Sodium increases the patient’s metabolism. The result is an increased rate of cellular activity with a more rapid utilization of carbohydrates, fats and proteins. Bodybuilders and athletes are particularly attracted to this drug for its ability to burn off body excess fat. Most often utilized during contest preparation, one can greatly decrease the amount of stored fat without being forced to restrict calories. 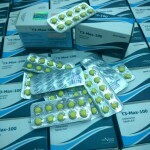 It is often used in conjunction with Clenbuterol and can produce extremely dramatic results. This combination has become very popular in recent years, and it was also noted that when thyroid hormones are taken in conjunction with steroids, an increased anabolic effect can be seen due to faster utilization of proteins by the body, increasing the rate for new muscle accumulation. 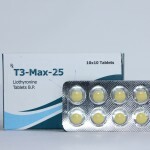 Liothyronine substances are also is used for suppressing production of thyroid stimulating hormone in patients with goiters and for testing how well the thyroid gland is functioning. 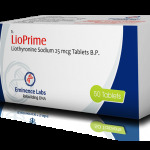 The doses of Liothyronine Sodium should be increased gradually; the product should be taken with precaution by women. Taking Liothyronine for too long and/or at too high a dosage can result in a permanent thyroid deficiency. Optimal liothyronine doses are different for each patient and vary depending on the patient’s age, weight, symptoms, blood levels of thyroid hormone and underlying conditions such as heart disease.